The architecture of the Japanese practice SANAA, led by Kazuyo Sejima and Ryue Nishizawa, seems to be conceived so as to be spatially and programmatically ‘uncertain’, with configurations that tend to be freed from constrictions. Characterised by multiple layers of transparent materials, their buildings establish a continuous relationship between interior and exterior. This study focuses on the analysis of one of the buildings designed by SANAA, the Rolex Learning Centre (RLC). 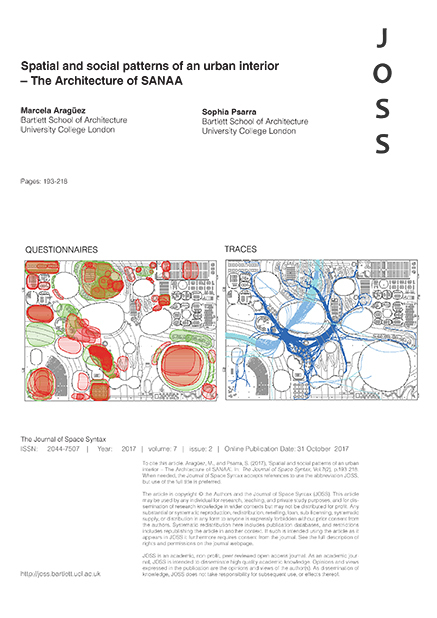 The study provides an in-depth analysis – the first of its kind using space syntax methodology – of this building looking at both spatial properties and the social practices of users. The particular geometry of the building entails methodological challenges and the customisation of syntax tools derived from a fluid and continuous undulated interior. New methods of syntactical analysis are tested in order to overcome the particular morphology of the building. In particular, this is done by the development of a series of methodological experiments concerned with the comparison of visibility and permeability values and the role of the third dimension in space syntax theory and applied software. The study will first analyse selected buildings from diverse functional and formal typologies to provide a background analysis of the architecture of SANAA, to then later address the RLC. The first section of the study identifies a strong foreground structure in the buildings analysed, but almost no correlation between function and configuration. The analysis of the RLC shows how the spatial arrangement is determined by the use of transparent and opaque materials, which constructs different levels of privacy, and how this is reflected in a diverse combination of levels of visibility and permeability in different areas of the building. Finally, a closer look to the spatial practices of users in the RLC reveals that the places that are used in a more informal way are those characterised by a disjunction between levels of visibility and permeability. This is considered an incisive conclusion that, added to the methodological experimentation performed in the study, can provide an alternative way to understand the relationship between spatial complexity and functional uncertainty in buildings.